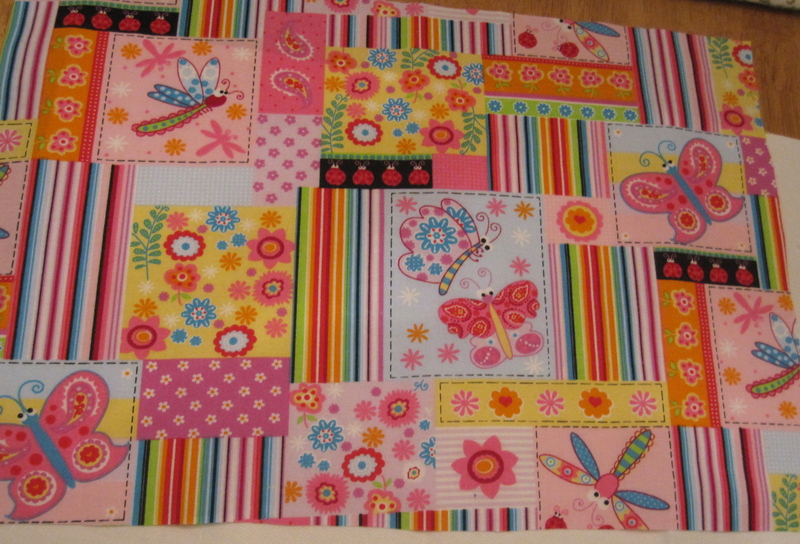 She likes bright, cheery colors, so when I found this fabric in my stash, I knew it was the one for her. Now… what to make for her?…. Hmmmm…. So I thought she’d enjoy a little tote bag of her own to carry these small items. 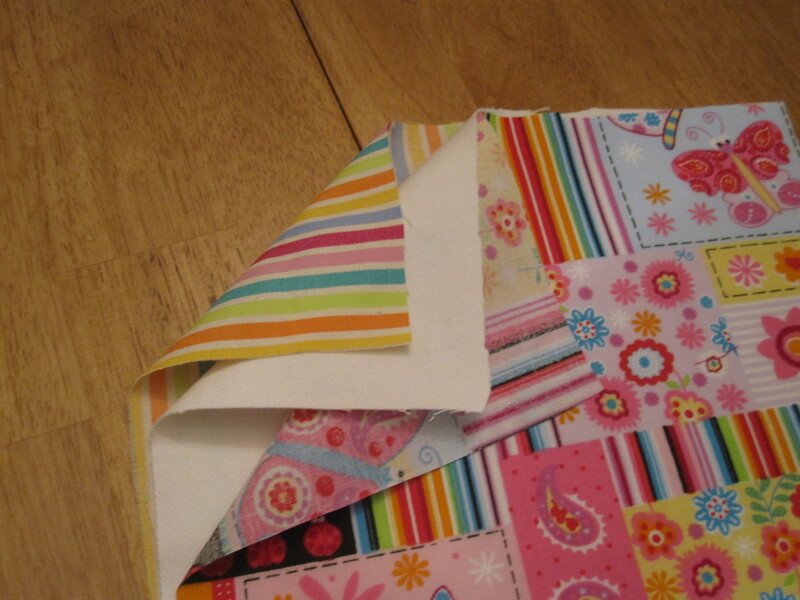 I didn’t have heavy weight interfacing, so I used canvas (my Dad’s an upholsterer so I get remnants for free!) as the lining. It worked great and gave the tote bag a real store-bought feel because of the extra sturdiness. Note: please use a heavy weight needle in your sewing machine (same you’d use for denim) in order to sew all these layers without a problem. The important thing is that both corner cuts are the same. 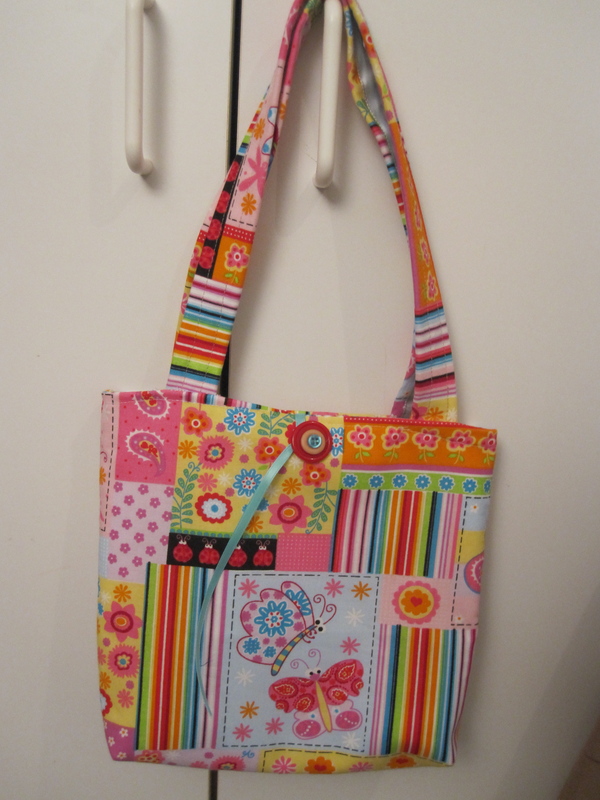 I made the tote bag about 10 inches long by 8 inches wide… just right for a little girl. 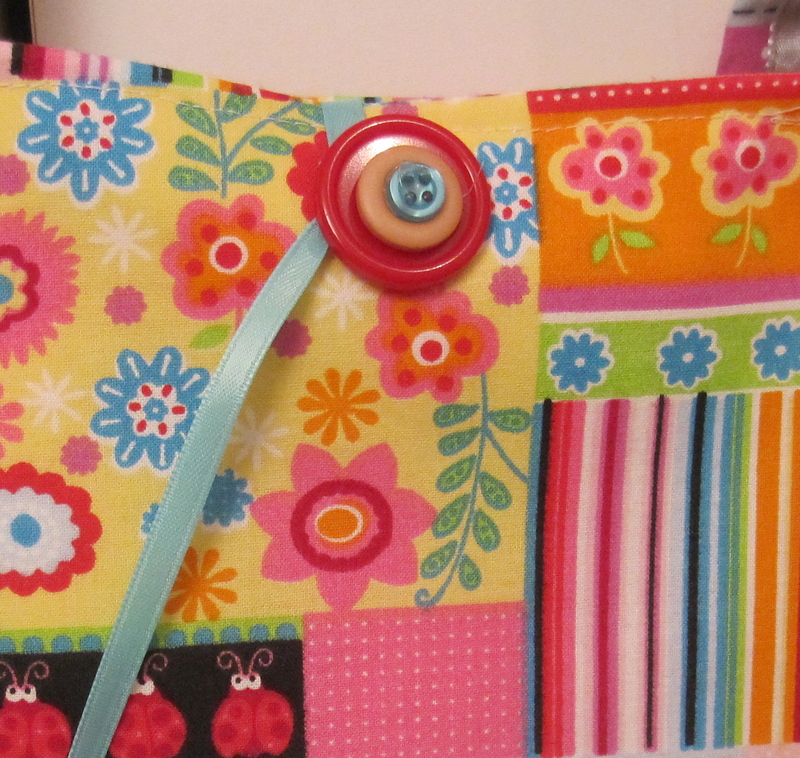 For the closure, I hot-glued 3 buttons together (the large red, the orange, and the blue) to match the fabric. 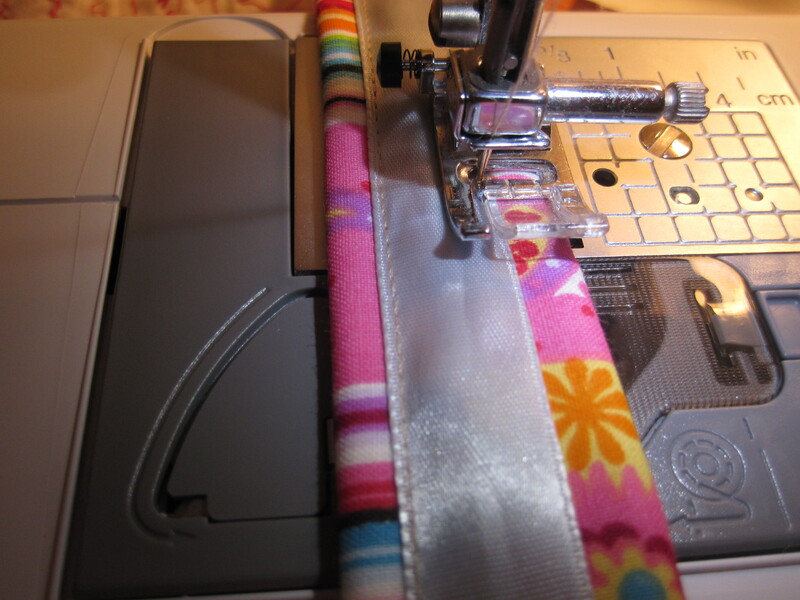 I used a half-inch wide ribbon to wrap around the button and keep all the goodies inside the tote bag. …and it was fun to make! 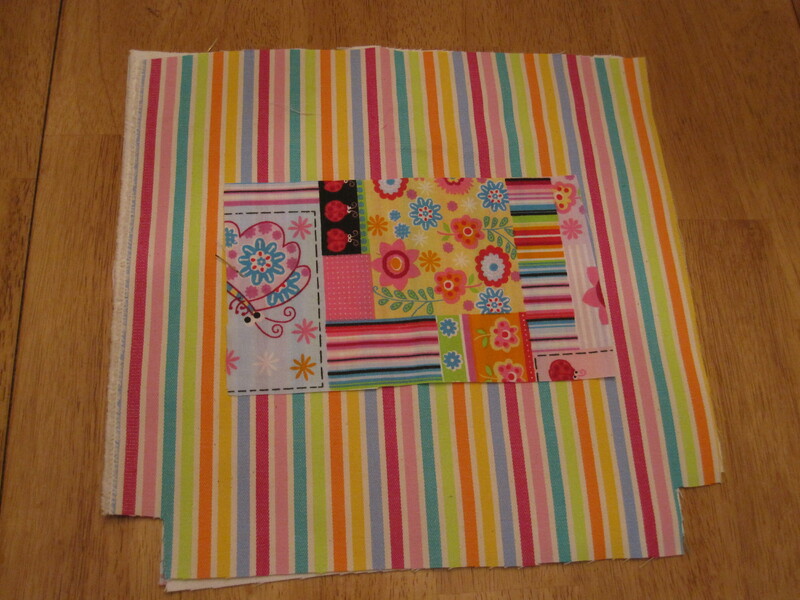 I also made her a small journal cover (out of the same fabric) to tuck into her tote bag. She’s happily being creative with her new little gifts. Thanks! 🙂 It’s fun to make these little projects. They are quick and relatively simple, so it’s done in no time. I’m guessing the tote bag was one of her favorite gifts. Thank you for sharing how you constructed it. Her Mom told me she’s been enjoying it. 🙂 It’s so nice when you know they liked the gift. I left some stuff out but I got so busy with the sewing that I forgot to take pictures of some of the steps! I’ll do better next time. The tote is adorable. I can’t imagine any little girl (or big girl for that matter) that wouldn’t love one of those. Great way of using ups the bits of canvas too. 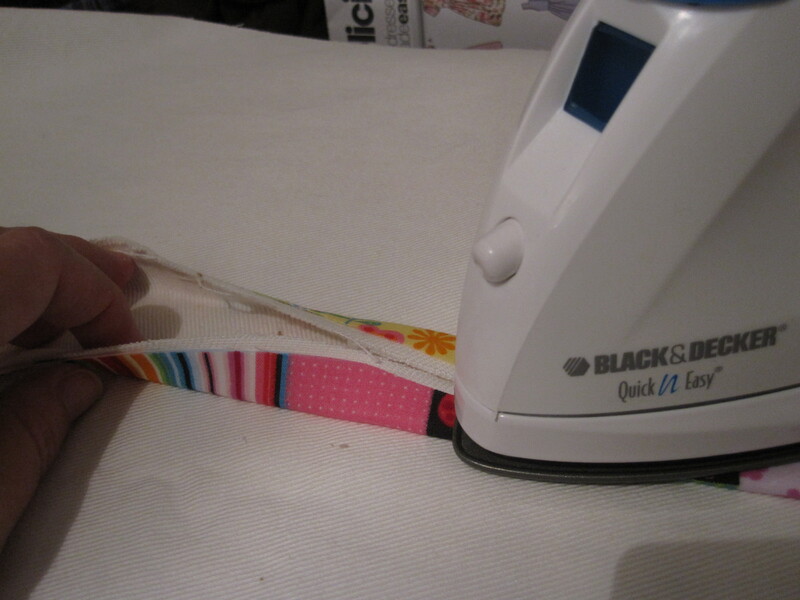 I really wish I was more skilled at sewing. I made curtains for my camper last year and that was really stretching my patience – but I DID IT! Good for you!! 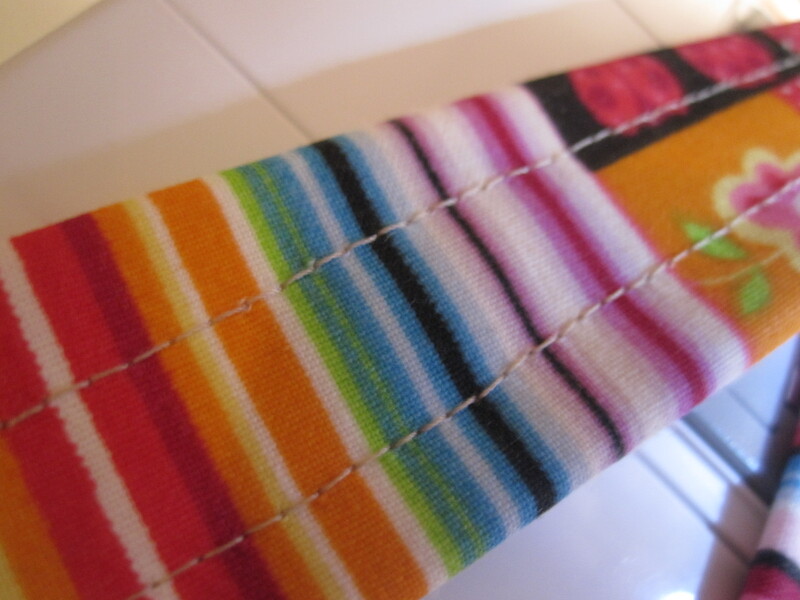 One thing I can say for sure… the more you sew, the better you get at it. When I first started I didn’t know anything, and slowly (and with a lot of patience) I’ve been learning as I make one project at a time. Little Erika thought the colors were just right for her! 🙂 Thanks for stopping by! Thank you for sharing this, Daisy! I loved it and want to make more gifts to give. You inspire me! God bless! 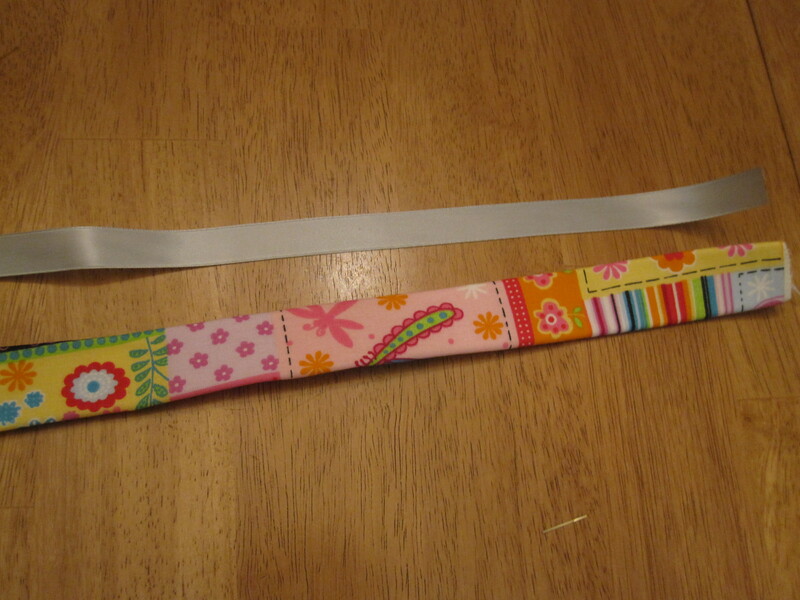 I love the way you added the ribbon to the handle! I am going to try that. Thanks for the tip! Q – LOVE this! We’re on a stash busting theme this year so this is a perfect project! 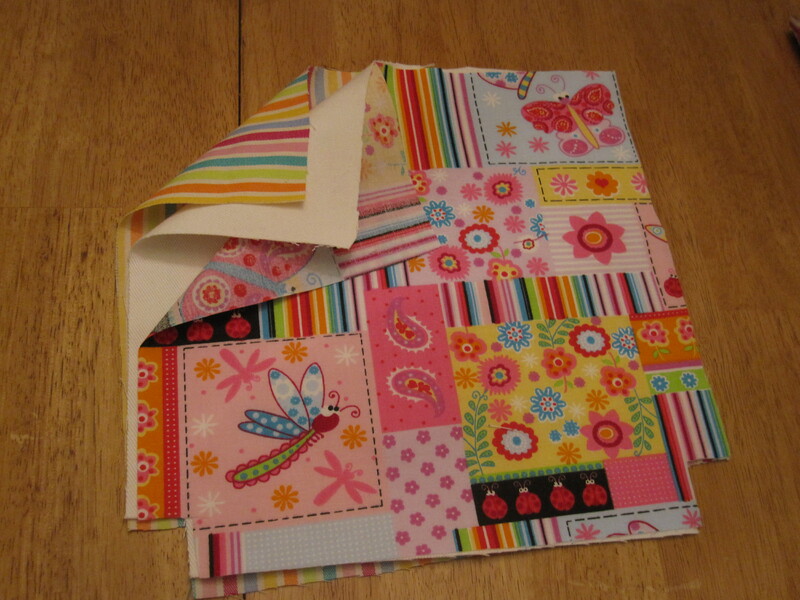 Q – Um, I could open my own fabric store! LOL! No more until I make a HUGE dent in what I have. 😎 Really love looking at your site! Ah, thank you so much for your very kind comment! Thank you! I agree with you, hand-made gifts are the best. Love this–so bright and cheerful. 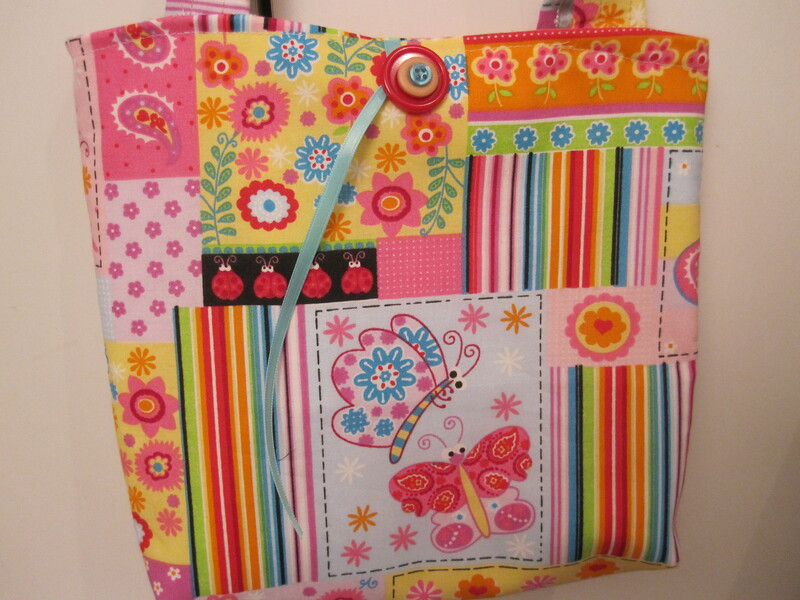 I have a new sewing machine my son gave me and I’m a failure at using it– I think I need lessons– would love to make bags like these! Daisy, this tote is cheerfully adorable!! I love the added touch of the triple button closure too. Thank you for liking my blog! I’m impressed with the totebag. The colors and butterflies are very appealing to a little girl.